As of today, I’ve donated about 3 feet of hair in my life. This was my fourth time donating my hair, but I won’t be sending my 8” ponytail to Locks of Love, not anymore. Donating my hair has become something near and dear to my heart, and is something I’ve done since I was little. I was probably only 10 or 11 when I first donated my hair with my older sister, and a few years later, we did it again. Both times, we donated our hair to Locks of Love, since that was just what you did. There weren’t really any other well-known charities that took donated hair and made hairpieces. When I donated my hair two years ago, I did my research before sending my hair anywhere. I took my time looking into the different organizations and learning about where the hair really goes. I wanted to know how my hair would be used, who it would go to, and whether they’d have to pay for it. In trying to pick the best place to send my hair, I had a few main considerations. Because of the length of my hair, I wanted my 8” donation to be acceptable, and I absolutely wanted to give to an organization that gives out free hairpieces, preferably to kids. When I was really little, many years before I donated my hair the first time, I had a major reaction to a common vaccine and ended up losing most of my hair. I was too young then to know what was happening, and I don’t remember it now, but I know it was scary, and scary for my parents. My alopecia was mild and temporary. My hair grew back. But that’s not the case for many kids. And that’s why donating my hair is just a part of me now, and something that I hope to continue to do as long as I can. When I did my research and found Children With Hair Loss, and learned that they give free hairpieces to kids with all types of hair loss (and CWHL kids are eligible for a new hairpiece every year until they turn 21), I knew where my hair was going. CWHL was created to cater to kids when the founder, Regina Villemure, had a niece with Leukemia and saw that many kids were wearing hairpieces made for adults. Children With Hair Loss’s mission spoke to me, and that’s why I’ve chosen to send my hair to them instead of other organizations. There are other places to send your hair, too, and a few others I’d still choose over Locks of Love. Locks of Love has recently been questioned for their number of hair pieces produced versus number of donations received (read about this here and here), and doesn’t give out all their wigs free of cost, although you have to really dig in their website to find this information. They also sell hair deemed unsuitable for wigs to help offset manufacturing cost, which makes sense, but I’d rather send my hair off knowing that it won’t just be ‘sold for parts’, in essence, if it’s not good enough. None of the things I learned about Locks of Love sat right with me, and since there are other great organizations that accept hair, I crossed Locks of Love off my list. In general, I’d rather send my hair to an organization that is honest about what they do with their donated hair, provides hairpieces free of cost, and hasn’t been scandalized in the news. There are other places that haven’t been scrutinized and questioned, so I’d rather just avoid the drama altogether. Wigs for Kids and Pantene Beautiful Lengths are two other reputable places to donate your hair, although Wigs for Kids requires a 12” minimum donation. I’ve also heard great things about Beautiful Lengths, and they accept 8” ponytails as well. I’ve done my research and chosen to support Children With Hair Loss. I highly encourage you to consider donating your own hair, but I also recommend doing your own research before choosing an organization to support. And finally, my before & after from the big chop today! You can see more about my hair donation on my Instagram! Thanks for reading! 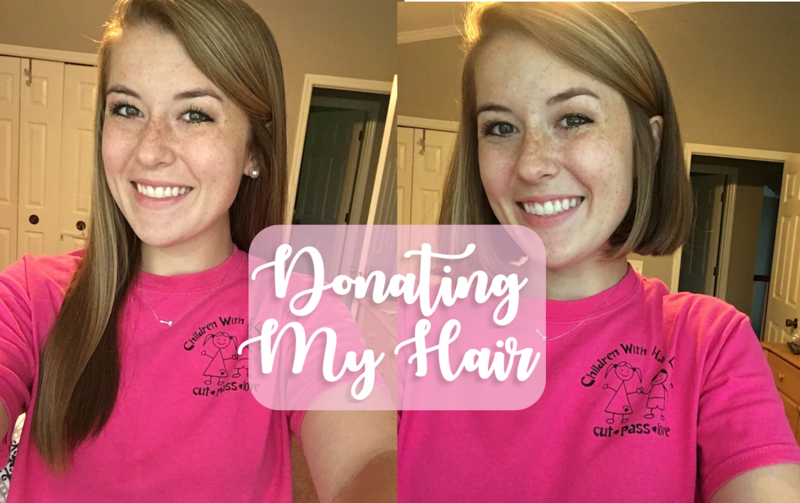 I’d love to hear your experience below if you’ve ever donated your hair or considered it! How to Get a Natural Summer Glow: Self-Tan Review! I totally agree! They say they ask some patients to pay what they’re able to, but if they’re in that situation I don’t think they should have to pay at all! So glad you found a good organization! I’ve donated my hair to Locks of Love before, but if I ever do it again, I’ll use Children With Hair Loss. Love your haircut! I’m glad to hear it, thanks Allison! I absolutely love locs of love! I have donated 4 times! If my hair grew as fast as it used to I’d keep donating!